A few nights ago, my uncle and his friend came up for dinner with my dad and me, when we were on our mother/wife/brother/son-less stint. Since I was baking for the guys, I knew I didn’t need to make anything pretty or fancy, just downright delicious. When I asked my Dad what he wanted he said “chocolate chip cookies.” Typical. But every time he asks for them, I refuse, so I decided to try to take his request into consideration while putting a more exciting spin on it. And so these yummy Chocolate Chip Peanut Butter Cookies were born. I’m not typically a fan of peanut butter cookies because they aren’t (usually) gooey and chewy and chunky, which is how I prefer my cookies. I don’t dislike them, I just don’t typically crave them. But with chocolate chips and oats in the mix, I was pretty well convinced they’d be delicious. And they were! I made mini cookies which enabled everyone to have ” a few” instead of just one (depending on who you asked, “a few” meant anywhere from 2 to 10). 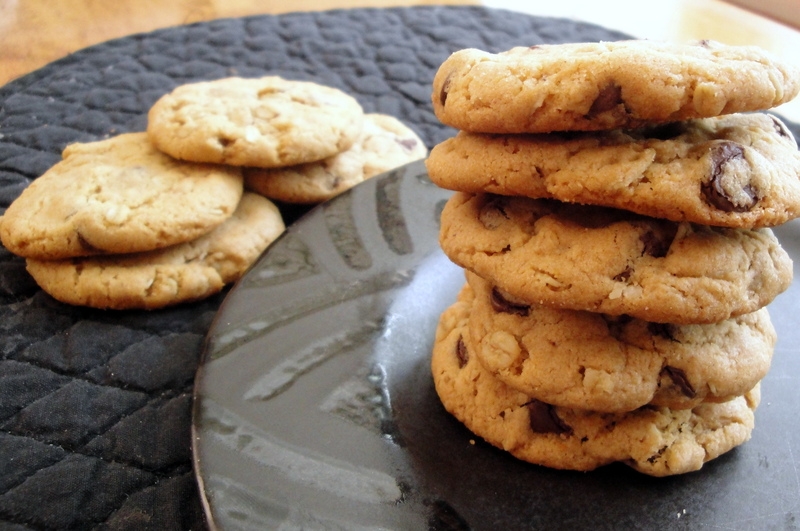 They were a bit chewy, certainly more so than typical peanut butter cookies, which was great. 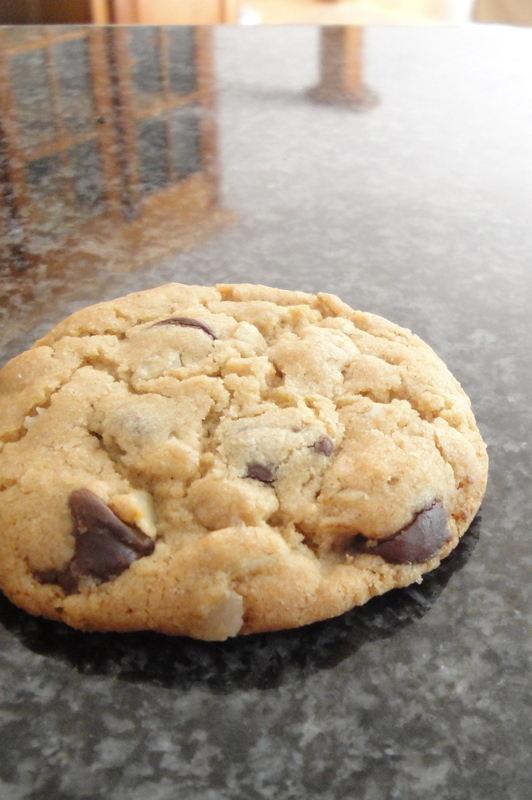 The chocolate chips added a nice rich sweetness to balance the salty peanut butter. The oats just add another element of texture, and help to give the cookies their slightly chewy texture. 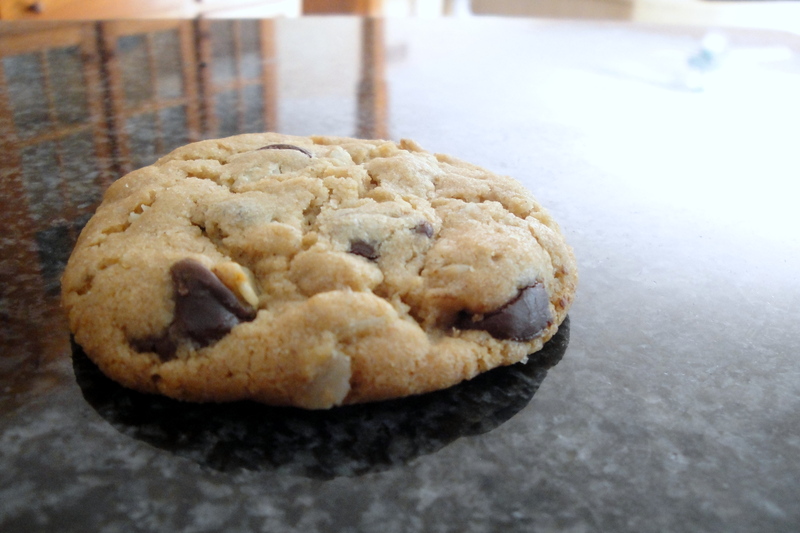 The end result is a light, sweet, and tasty cookie — pretty close to the perfect balance of sweet and salty, crunchy and chewy. Yummy! And since they are small, you can have one after lunch, and a couple more after dinner, and it hardly even counts for one whole dessert! Preheat oven to 350 degrees F. Cream both sugars and butter. Beat in peanut butter, vanilla and egg. Stir together flour, baking soda and salt. Add to batter and stir until incorporated. Stir in oats and chips. Drop by tablespoons on to lightly greased (or parchment lined) cookie sheet. Bake 10 to 12 minutes. Let sit on cookie sheet for about 3 minutes, then transfer to a wire rack to finish cooling. The only change I made to this recipe is using white whole wheat flour in place of the all-purpose flour, because that’s all we have. I think that the peanut butter is a strong enough flavor that you can’t even tell the cookies are made with wheat flour! Pretty cool is you ask me. Once my mom and brother got back, it was really warm out so I decided to make ice cream sandwiches with the peanut butter cookies. 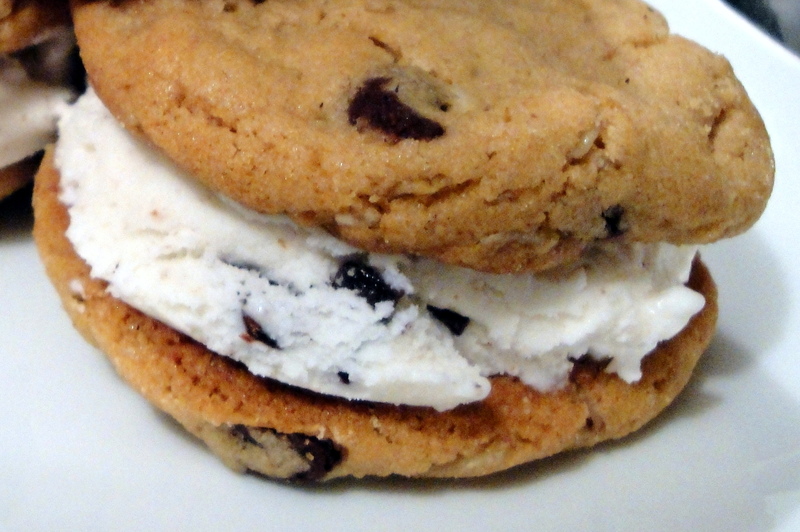 I didn’t have my ice cream maker in the freezer so I got some store-bought chocolate chip ice cream, and the sandwiches were SO DELICIOUS. 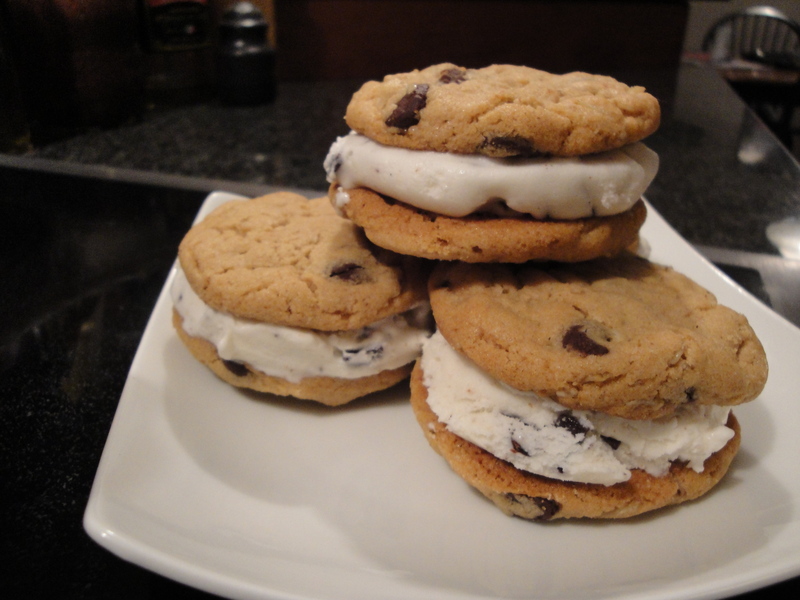 There is something about creamy ice cream sandwiched between two already awesome cookies that’s really just incredible. 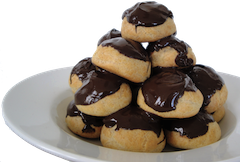 If you try these cookies, why not reserve a few to have with ice cream? You won’t regret it! I haven’t been baking as much lately because life’s just been hectic and crazy and it seems like there is always something I need to be doing. But I’ll get back in the kitchen before too long, I can’t stay away!